In 1961, Meth-Wick Community opened its doors with a mission to serve the older adults in Cedar Rapids. 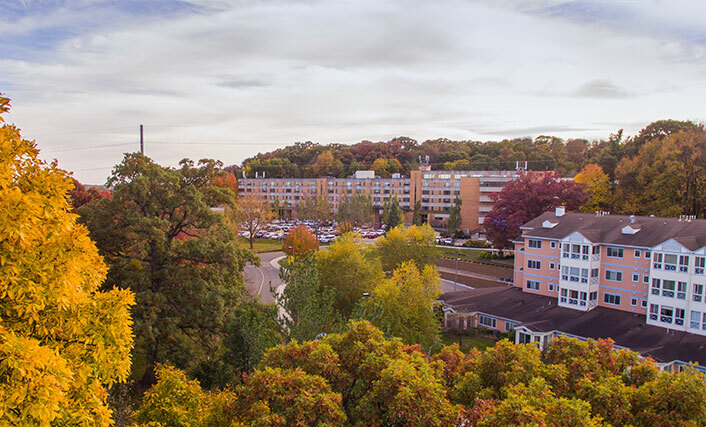 Over the next half century, we expanded our campus from one building to five distinct styles of living in eight different residences across a 68-acre campus. Meth-Wick is continuously growing and expanding so older adults can find the perfect home for their lifestyle on our campus. 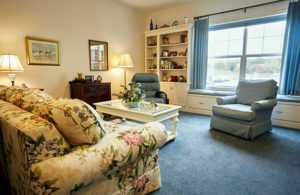 Common area for resident use on Oakwood ground floor. 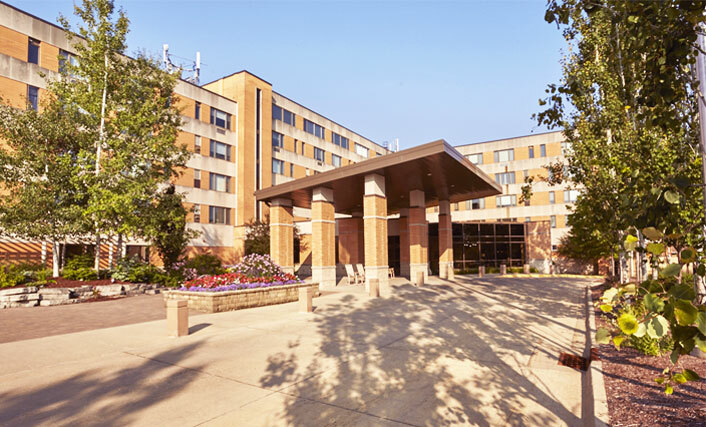 The newest addition to Meth-Wick’s campus are the Oakwood condominiums, located on the eastern side of campus near Arbor Place. It’s an independent living setting for residents who value their privacy but still wish to be part of a community. 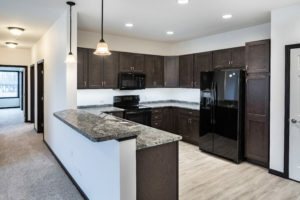 For example, Oakwood residents can prepare meals in the top-of-the-line kitchens in their homes or use the dining services at The Manor across the street. They can entertain friends and neighbors in their spacious units or take part in wellness and social activities around campus. 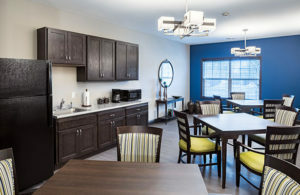 Oakwood consists of two-bedroom units. The three-story building has six units per floor, ranging in size from 1,176–1,822 square feet. 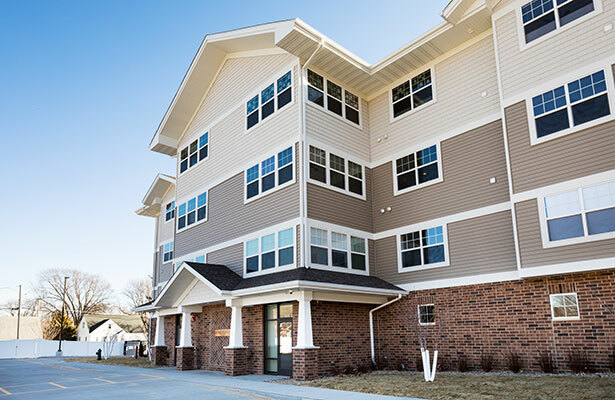 Every condo includes on-site storage and comes with an indoor parking space on the building’s ground level to protect you and your vehicle from the rapidly-changing Iowa weather. Natural light fills the living room in a current resident’s condo. We finished construction on the building in 2017 with 18 new units furnished with modern appliances, customized finishes and an abundance of natural light. 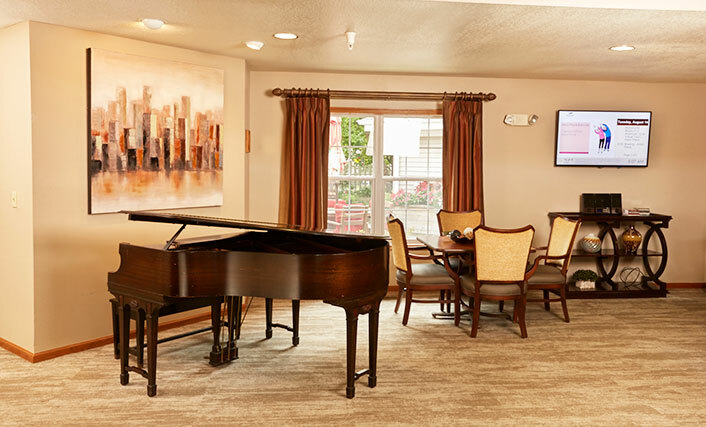 Several of the homes come with a sunroom and all Oakwood residents have access to a common area in the building for organized or casual gatherings with neighbors. The building is located just down the road from The Manor, the social hub of Meth-Wick campus. Relax at the Manor Brew coffee shop, boutique library or beautiful outdoor courtyard filled with gardens and waterfalls. Get moving at the Fitness Zone with state-of-the-art, senior-friendly exercise equipment or at a workout class at the Meth-Wick in Motion exercise room. The Manor also features a gift shop, doctor’s office, billiards room and beauty shop. Modern kitchen furnished with stylish new appliances. The home you choose should reflect the life you want to live. 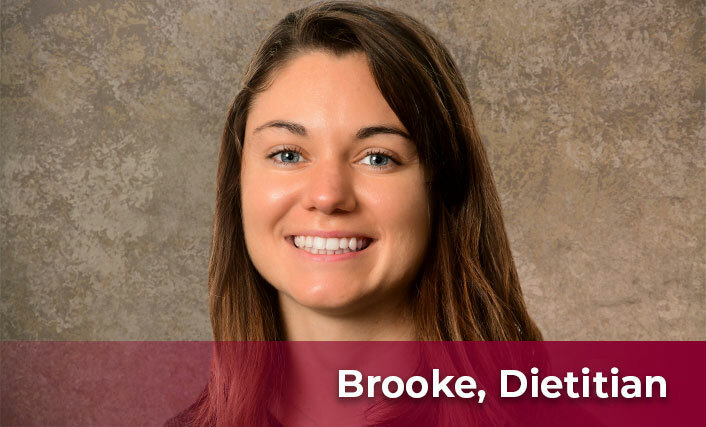 When current Oakwood resident Gretchen Beckhelm decided to move back to Iowa, she wanted to find a home close to her family but in a community where she’d be able to get the assistance she would need if her health ever changed. Oakwood turned out to be the perfect fit for Gretchen. Read her story. Could Oakwood be the perfect fit for you? Call sales manager Julie Farmer today at 319-297-8638 to learn more or set up a campus tour.